Yes, the bed is decorated with Christmas lights. Die-hard Stranger Things fans can now use their love for the series as an excuse to go on a vacation. As part of its celebration of Stranger Things season two premiere, a midtown Manhattan hotel is offering up an exclusive package that combines all the strange things we love about the hit sci-fi series. Starting today, The Gregory Hotel is letting you book a room that puts you in the show as you watch it. For fans interested in getting in on the exclusive experience, the “Ex-stream-ly cozy package” allows hotel guests and fans of the show to binge the second season in a big way. Take Netflix and chill to a whole new level as you stream the entire second season from the comfort of your hotel room, thanks to Google Chromecast. Of course, it wouldn’t be an “experience” if it didn’t have that Stranger Things aura. When you watch, you’ll settle into a room decorated with a colorful Christmas light tapestry of Will’s message from the Upside Down. Meanwhile, you can cozy up on your bed with a fleece blanket and pillowcase. 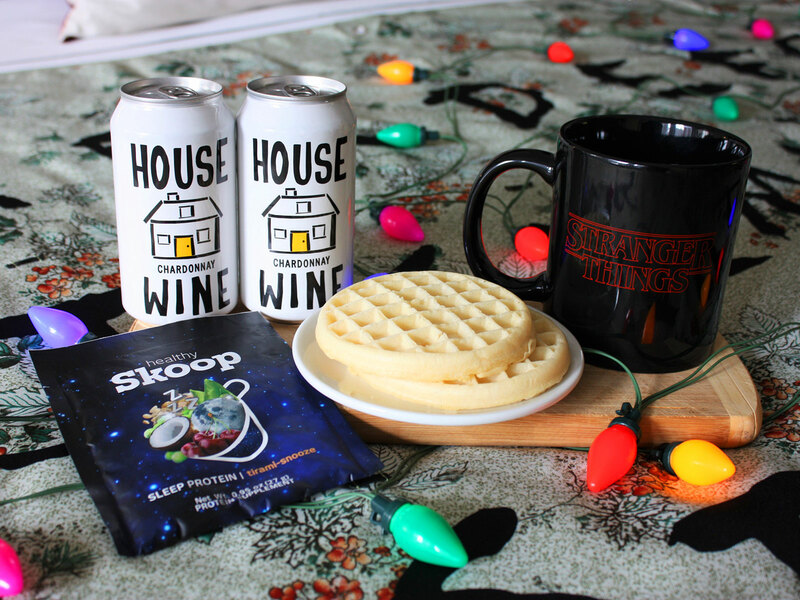 And for when you get hungry (which any good TV binger knows they undoubtedly will), you’ll be offered Stranger Things-themed snacks to top off your viewing experience. While Will’s message in light’s might be coming from the Upside Down, all of the food will be inspired by what characters who aren’t in a terrifying otherworldly dimension are eating. That, of course, means you’ll get your very own box of Eleven’s favorite food, Eggos. The menu of curated snacks and beverages will also include canned House Wine (so you don't spill on the sheets) and Healthy Skoops Sleep Protein to help you sleep soundly, even if you've been spooked by watching the show. You’ll be able to drink either in your take-home “Friends Don’t Lie” mug. There is a limit on the amount of food that comes with the package, and you won’t be able to take the blankets or light-tapestry home. But you can begin booking your stay, which starts at $249 a night, from now until August 30, 2018.